I started 6 years ago. My first CD was called Doctor Acid, together with Nansy Brandes, and since then I had stuff on different compilations. My whole attitude changed since I came back from Japan. Till then I was thinking "I make music because I love it", and then I realized that this is the only thing I do (the same today), but I don't make a living out of it. I mean, I was making music, and there were few people, musicians, that were thinking highly of me, but you gotta live of something, and from that I couldn't make a living. I always thought that Israel is a small place, and I have to look outside, abroad. And then, when I got to Japan, I was there and not here, and I realized that what happens here in Israel, is the real thing! Japan has great parties, end of the world parties, and there are amazing parties around the world, but in Israel we have the number one force and nobody can do anything about it. It's parties, people, call it a groove, a cult- whatever- here is the real thing. And from Japan I suddenly saw it and thought to myself how do I evolve out of this- because this is what I really like doing. 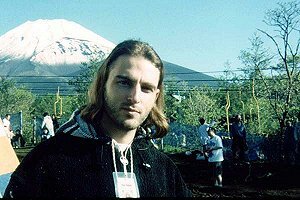 Originally, when I went to Japan, I was planned to play one party, but I found out it was great and made more parties, I stayed there 3 months, worked also in the studio and made some tracks that came out on my last album. I thought to myself how can I develop from this thing, how do I make money out of it, because there are so many people into this music, tons, and they don't get what they want. They hear it at parties, they're crazy about it, they dance only to this, they try to record the stuff in any way possible- but they can't find it in the record store! I understood that this is my chance, my breakthrough, maybe from here I can get in. And really when I got back to Israel, that was the first thing I did. I made Over the Sunrise, and then had my album out, then I produced for Eyal Barkan the Good Morning Israel CD and the Good Morning Israel track, and now- the new CD. So now you make stuff because you love what you are doing or because it sells- or because of both? You also make stuff that wouldn't sell? There's nothing like that. That's my taste. When I hear something like this (the new CD that is playing in the background), this is what I like most. When I went to Japan I already had Tarzan, that turned this country upside down, and I left Eyal with Comic Strip. Eyal phoned me to Japan and said: "just come back to Israel and see what it does in a party. I can play anything in a party, but the moment I put this track, it's over, the party is upside down". Things like that really move you, you try to think- let's make the connection. I look at myself as an artist, but I'm like a store, I open a business, so I don't search only for the gimmicks and that stuff, but it's still important. Let's say it is a good combination- I make the stuff I love and the crowd, with their love, by buying my CDs, shows trust in what I do. When someone comes over and tells me: your music is not cool, it's melodic, and that sort of stuff- O.K. that's what I like. I rather do something I love and the crowd appreciates, then do something that I don't really like and will get me applause from some DJs that will say- Holly, you made it big. If this happens, I know that I'm lost. There are people that if I play them my stuff and they have a negative opinion I'm happy. For example, Zoo-B is one of my best friends, if I'll let him listen to something I made and he'll say WOW, I know I'm lost. If he'll tell me: turn it off, fast, I can't listen to this, then I'll win- that's my test. You know, I'm meeting Zoo-B next week. I'll play him the interview..
Again, if Zoo-B tells me: This is an amazing track, I never heard anything like that, amazing sounds, what a progression. Then it's over- I have to get back in the studio and edit everything from the start. That's how it works. There are more people that are my reverse indication- if they say: turn it off, I can't hear that. I know I'm in the top league. Again, I rather not get applause from some of these DJs, which I appreciate, but differ from them with my musical style. You have in your new CD sampling and music of Zohar Argov (A legendary Israeli singer who sang oriental-middle eastern songs). Where is that coming from? Do you listen to that kind of music? No, I don't listen to that kind of music, but I always wanted to do something with Zohar Argov. Look, first of all I write the music, write what I like. I also try to get good gimmicks, so that someone who hears the track, and there are a lot of tracks out there, a big variety, will never forget that track- even if he heard it only once. Someone who heard Tarzan on a track will never forget it. When I put Abra Kadabra in a track, everyone was talking about Abra Kadabra. It's something you try to get into the music. All and all, I don't know how all this turned into something so serious, I really don't see it that way, it's just music, it's fun, you can laugh about it, you can laugh with it, it doesn't have to be such a serious thing, such a cold thing- people take it all too seriously. You can just listen and have fun. Here, listen how I start track 3 in the new album: "My name is Pinocchio, and this is Bela" (The sample is in Hebrew). I'm making fun of the world, you see, I put Pinocchio, it makes me laugh, it does something to me, and to a lot of others. There are off course those who say: again, his poor gimmicks. Yeah, right- I'm just a lousy gimmick man. But today there are gimmicks without music. I don't say that everything that comes out in the scene is the best, but it's a matter of taste to me, and I have my own taste, that's it. So, you can't talk about quality music, about complexity? No, and I will tell you why- if you tell me something like that about a CD and I show you that 5000 people bought this CD, then 5000 people love this stuff. So you think Ace of Base is good music? Sure! It's some of the best stuff in the world, not to talk about the quality of production. You know Zvika Pik (a 70's famous Israeli singer who people tend to make fun of, while he tends to not realize that) is writing a song for Ace of Base- so, he reached the top? You can't make fun of Zvika Pik, he sings 10 songs for 20 years, the same songs and the people buy it, so you want to tell me it's not good? It is. It's a fact, he is performing all the time, people love him, want to hear his stuff, and all the crowd sings with him at Dan Shilon's show (the most famous Israeli talk show). Songs people never get tired of. He did it big time, with the same hair, the same tights, for 16 years, every week in the gossip columns, he has a good life. So you also want to be in the gossip columns? No, I want to be in the gossip columns in a business magazine. Talking about business, how did you get to Sony? A friend gave them the CD, without me even knowing about it. It started with an offer (that still exists) for two CDs, one will be a compilation that I will compile and later the album. And then, 3 months ago came the idea that I will release the album near Christmas, it will be released around the world and then in Israel- the point was to try and push the music around the world. Again, if we look at MTV, everything is easy listening-trance night music will never get there. Only a small group of people hears that kind of music, people that I respect much, but still a small group. 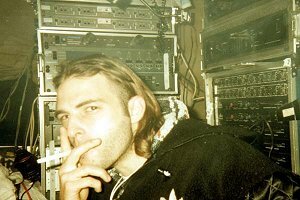 And my music gets the closest to MTV from the direction of trance, it's easy to listen to, it catches fast, it doesn't hit you on the head, and it does not have too much irritating 'games'. Look, it's an experiment, I really appreciate this chance, and for me it's the most perfect thing that happen to me in my life. How much are they going to push it? Advertisements of all kinds, newspaper articles abroad. Look, I never worked with Sony before, so I can't really tell you how they work. But, I can call George Michael and ask how's the company, do they pay, are they o.k.? I think he got a down payment on his new album, something like 60-80 million US Dollars. Let's say we are a bit different, so give me one percent, something symbolic- I will settle for that. I don't know how much it will sell overseas, here in Israel, I can estimate, but abroad I really don't know. However, the fact that a big corporation like Sony took it will help a lot, maybe it will work, and if not, I'll settle for Israel. But Sony has keys to doors that I don't have. Good luck! And this is your only direction, or are you thinking of other musical directions also? This is the thing, this is the thing that works most today in Israel. You see 10, 11 years old kids listening to it, coming to look for it in the record stores. We are past the days of secret underground parties of 100-200 people, river here, stream there, a cave near the dead sea- it's over. Oh, you still have it, but today the foundation of this music is... the best way to say it- it's the disco of 2000. Just like disco was once-that's what we have today. You rather be Abba than Pink Floyd? Listen, I have mixed emotion about what is going on. Why? Because it was fun in these times when every thing was underground, secret, only few people knew what was going on and you felt you belonged to a small group. I remember going to parties with the DATs, playing the music in the car, or hearing someone listening to trance- you only had a little eye contact and you knew that we are the same, he is one of us. This is disappearing a little, because of the commercialization. On one hand what is going on is good for me, because I sell, on the other hand, I miss what was then, the innocence, the naive way of thinking, the genesis of it all, in nature, something new which no one knows about. But again, you have to adjust, there's nothing else to do. I'm in this a lot of years. I can't tell you that a party does the same things to me- not anymore. Every once in a while I go- if there are guests from overseas, I'm always invited, so sometimes I go, to feel what's going on, apart from that, the answer is no. Who would you go and listen to? I'm not going to hear anyone in particular. I can't give you a group name, an artist's name. I care about the track, I look at each track independently, If I like the track, I don't care who is the artist. Besides, when I listen to a track, I'm not your average listener, I listen more to the technical bit. When I go to a party and the speaker is buzzing it bothers me, same with bad mixing. Don't you have artists that you can say about them- this guy works amazing, technically. Sure- Martin Freeland, Paul Oakenfold, Mark Allen, Tim Healy, and there are more. You think that the stuff that sells so good today, is technically good, sound wise etc. Let me explain something to you about this music, and that is also what is so fun about it. Not always the people with the musical talent, are the people with the financial means to produce the ultimate track- Studio, equipment, computers, synthesizers- all that costs a lot of money. I am lucky, because I teamed up with Nansy Brandes, who has been collecting equipment for years now, stuff people can't believe I have access to. But he collected it for years and collecting costs a lot of money, and not always people have the money, especially if they're 16-17 year olds with musical talent. I believe they will get better as time goes by, you gotta give them a chance. And again, there are 3000 people who like this stuff. A kid in the 9th grade doesn't say to himself: "this is not quality stuff". And in this scene what counts is what the audience's love- you don't have P&R, you don't get to be played on the radio, you don't get to appear on Dan Shilon's show. The audience loves it- they will buy! They don't like it- it's over. Would you like to appear on Dan Shilon's show? Where are you going to play? In Israel? Abroad? Yes, there will be parties in Israel and abroad. I'm going to Greece soon. I must tell you I don't really like to play, I'd rather sit in my studio. But it's part of it, and there will be parties. Where was the place you enjoyed playing the most? In Japan- Mt. Fuji. It was the end of the world! Just to see the mountain, and that doesn't happen a lot, because it is always obscured by clouds-there are Japanese people who never saw it even once. It was raining till 4 AM, and then suddenly the sky opened up, I saw the mountain in front of me and almost fainted. I sat on the ground for about 15 minutes and just watched the mountain.